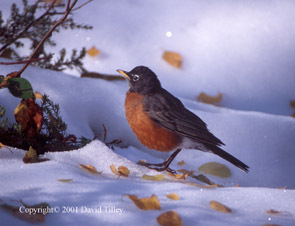 Photography of Wildlife & Natural Areas of Newfoundland, American Robin (Turdus migratorius). This migratory resident is caught off guard by an early snowfall driving its staple of fat earthworms below ground frost. The silver lining from the photographic perspective is the excellent contrasting background and ground reflection.